“The yearning for space is a deep human imperative. This drive to explore away from our planet greatly pre-dates the invention of any means to actually do it. Around 100 B.C. Cicero wrote of a dreaming of flying away from the Earth, into space, and looking back at our planet. So to me, space is where we are going, and it is a goal for a better humanity, and a symbol for a positive future.” — Lindy Elkins-Tanton, planetary scientist, director of the School of Earth and Space Exploration, and principal investigator of the NASA Psyche Mission. Launching in October 2023, the Psyche spacecraft will travel to a metal asteroid using solar-electric propulsion, arriving in 2030, following an Earth gravity assist spacecraft maneuver in 2024 and a Mars flyby in 2025. After a six-year cruise, the mission plan calls for 20 months spent in orbit around the asteroid, mapping it and studying its properties. Usually we launch things into space, but occasionally space sends things to us. 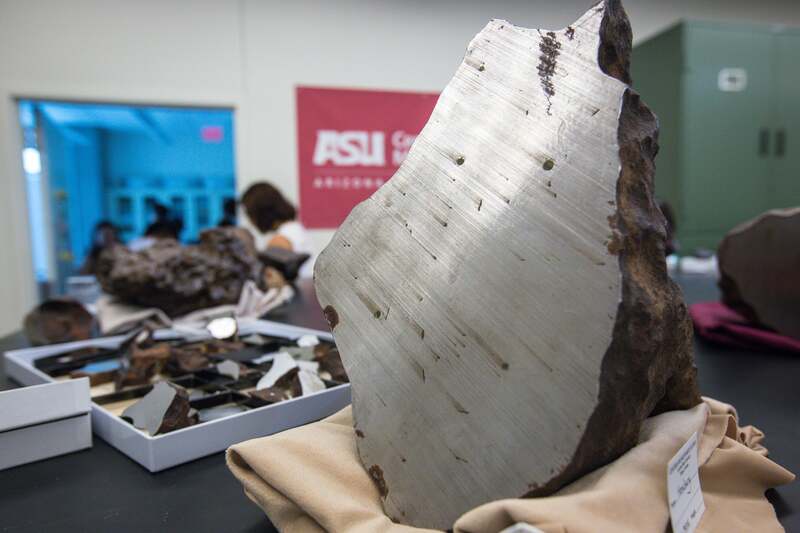 ASU’s Center for Meteorite Studies is home to the world's largest university-based meteorite collection, with more than 30,000 individual specimens representing more than 2,000 distinct meteorites. Center curator Laurence Garvie helped add to the collection last summer by leading an expedition into the White Mountains to hunt down a meteor, which fell in June. Seeing a fireball and finding the meteorite fragments is extremely rare. The pace of the push to Mars is stepping up as NASA works on its next-generation heavy rocket and private space companies continue their duel for primacy. As any Arizonan knows, you can’t go anywhere without water. There is evidence of ice on the moon, which can be mined for water and fuel, and an ASU-led NASA mission will map it. LunaH-Map will launch in 2018 and, once at the moon, embark on a 60-day science mission, consisting of 141 science orbits, using a suite of science instruments tucked into a shoebox-sized CubeSat. Where did we come from? Asteroids are leftover debris from the solar system formation process. An ASU instrument is part of the OSIRIS-REx mission to Bennu, an asteroid whose surface dust and dirt may record the earliest history of our solar system. Bennu may contain the molecular precursors to the origin of life and the Earth’s oceans. Red is the color of romance … and Mars, for which a lot of people have a lot of love. ASU is home to the Mars Space Flight Facility, a research center in the School for Earth and Space Exploration. Scientists, researchers, and students there specialize in using instruments on spacecraft at Mars for remote sensing research into the geology and mineralogy of the planet. Before the loss of NASA's Mars Global Surveyor in November 2006, the facility also operated the Thermal Emission Spectrometer aboard the spacecraft.